HEC’s focus on sustainable development and social business was well matched to my career goals. That and its entrepreneurial mindset were things that I didn’t find in other MBA programs. Another reason I chose HEC was the length of the program. Coming from an engineering background, I knew I would have a lot to learn on the business front, and 16 months seemed to be a good fit. 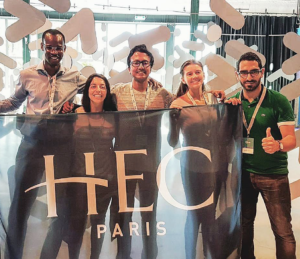 What advice would you give to someone just starting at the HEC Paris MBA? Open your mind. You’re going to meet a lot of smart, diverse people and you won’t be the smartest. Being open to other ideas will help you incredibly. Also to make sure to get involved in everything; whether it is clubs, trips or programs, it’s all so useful. What projects have you personally gotten involved in? I was president of the Africa Club. We organised a number of conferences and boot camps, and put together several networking events in Paris with people who have connections to Africa. We even travelled to London to attend the European Africa Clubs Convention. Attending the convention was a definite highlight for me. Another was volunteering for HEC Africa Days. I was very involved in organizing and recruiting potential participants for the three-day event. You also were in the team that created Agri Yolo. Can you explain what that was? When we learned about the annual Thought for Food Challenge, several of the MBA students who are interested in agri-business put together a team. The TFF Challenge is an annual competition searching for answers about how to feed the 9 billion people who will be on this planet in 2050. Our idea, Agri Yolo, was a platform designed to promote investments in sustainable agriculture by connecting agribusinesses, landowners and young investors to launch new projects. We made it to the top 10 out of over 500 entries and went to the finals in Amsterdam. I am currently working on taking the idea further and exploring if we can make it a viable entrepreneurial business project in Africa. You are also one of the pioneers in the MBA-MPA Double Degree program with SciencesPo. Any feedback? If you want to work in the public sector then I would definitely recommend it. It is very broad and you learn a lot about the economy, public policy and the differences between the public and private sector. There is also a rich choice of electives where everyone can find courses aligned to their interests. I focus particularly on infrastructures (business models, financing, regulation), public-private partnerships, transport policies and energy. Since my end goal is to help define infrastructure development in Africa and to find innovative solutions to finance that development, it’s been incredibly useful to me.